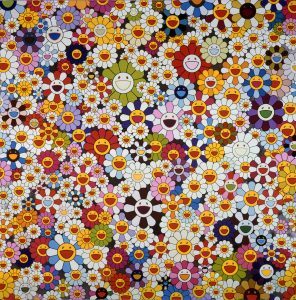 The Japanese Artist Takashi Murakami is known as the Japanese Andy Warhol because of his style- superflat. He is a typical pop artist who tries to blend high art and street art together. The characters that he uses in all his drawings are from a cartoon. He then turns them into artwork to blur the boundary between high and street art. He also collaborates with many brands like Louis Vuitton, Marc Jacobs, Shu uemura, and Vans to bring his art to a higher level. In his artwork, most of them have a highly repetitive patten. They bascially have one single prototype first. Then, after scaling, coloring, placing “randomly”, it can create a sense of depth out of the superflat drawing. The scale, angle, color, position, and overlapping all seem random by computational method. However, they are also chosen under consideration and randomness. His art is designed under randomness and to control it to be random. His use of a bold graphic and colorful anime and manga cartoon style brings historical Japanese art, the cartoon from his youth, and comtemporary art together. The seeming randomness of this artwork makes it even more interesting to the audience.